One of the most unusual careers in Hollywood is that of film director Edgar G. Ulmer. His career began in Germany as a stage actor and set designer where he eventually worked for Max Reinhart. Soon after he worked for the great F.W. Murnau on “The Last Laugh” and with Fritz Lang on “Metropolis,” and “Spies.” He also co-directed “People on Sunday,” whose creative behind the scene talent included Robert Siodmak, Curt Siodmak, Billy Wilder, Fred Zinnemann and Eugen Schufftan. 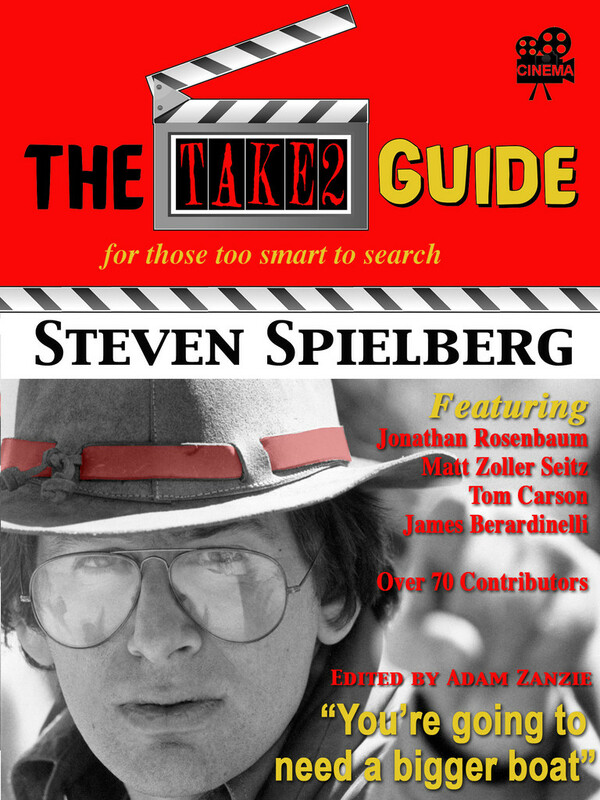 In America, he worked for Carl Laemmle Jr. at Universal, who would loan him to Fox so he could work again with Murnau on the films, “Sunrise,” “Four Devils” and “City Girl.” In his interview with Peter Bogdanovich (“Who The Devil Made It”) Ulmer also stated he began directing two reel silent westerns, most of which seem to no longer exist. Though his directing career would get off to a good start, his fourth feature was the expressionistic horror film, “The Black Cat“ (1934) for Universal, Ulmer would spend most of his career exiled to poverty row partially due to an affair with Shirley Alexander, the then wife of producer Max Alexander who happened to also be the nephew of Universal honcho, Laemmle. Shirley would soon after divorce Alexander and marry Ulmer. As Shirley Ulmer, she would work on many of her husband’s films as script supervisor. Ulmer liked the creative freedom that working for a small studio like P.R.C. (Producers Releasing Company) would give him. 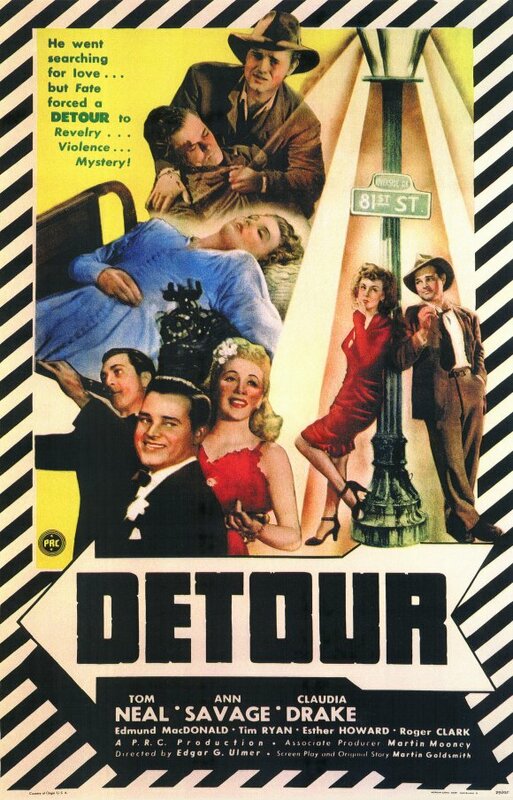 His most famous film from this period was “Detour,” a grim, bargain basement tale about a third-rate piano player whose life is going nowhere and only about to get worse. Al Roberts (Tom Neal) road to hell begins in New York at a dumpy nightclub where he plays piano deep into the night backing up singer/girlfriend, Sue Harvey (Claudia Drake). Sure, he has dreams of one day playing Carnegie Hall but fate has other plans for this born loser. Sue informs him she’s leaving for Los Angeles to pursue a career in Hollywood. Depressed with his career, his girl now three thousand miles away, Roberts hitchhikes his way to L.A. with plans to marry his doll and start a new life. Hitchhiking in Arizona, Roberts is picked up by Charles Haskell Jr. (Edmund MacDonald) also on his way to L.A. Roberts notices Haskell has some bad scratches on his hand. Haskell confesses it was from a woman he picked up a while back and it got a little rough when he made a pass. After a stop for dinner, Roberts takes the wheel while Haskell seems to have fallen into a deep sleep. Roberts pulls the car over during a rain storm to push up the convertible’s top. He attempts to wake Haskell but to no avail. When he opens the passenger side door, Haskell falls out hitting his head on a rock. Unnerved, certain no one will believe what really happened was an accident, Roberts easily convinces himself the police will accuse him of murder. He hides the body, changes clothes and assumes Haskell’s identity. Roberts biggest mistake though is yet to come. 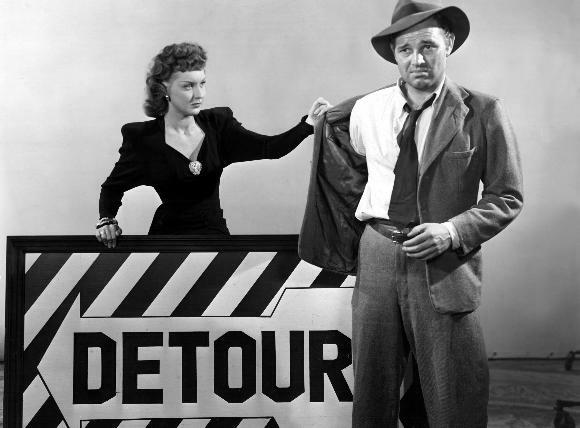 That happens when he picks up the hitchhiker from hell, a shapely, tough looking dame with an irritating voice named Vera (Ann Savage). “Where’s the owner of the car,” she spits out. “What did you do with the body?” It turns out she’s the dame who tumbled with Haskell earlier. 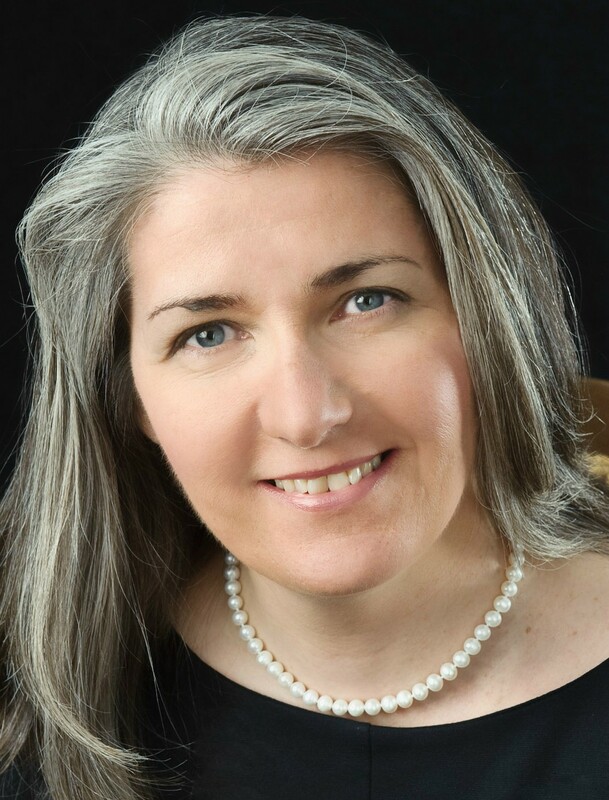 She quickly pegs Roberts as having killed Haskell (“What’d you do, kiss him with a wrench?”) and decides to blackmail him for whatever she can take. Vera is one of the most immoral, despicable femme fatale’s on celluloid, a coarse portrait of pure evil. If there ever was a good bone in her body, it must have broken off a long time ago. She plans a couple of schemes, first where Roberts, posing as Haskell, attempts to sell the dead man’s car. Then she reads in the paper that Haskell’s rich father lies dying in the hospital and fabricates a scheme for Roberts to pose as Haskell’s long-lost son in order to grab some of the old man’s dough. For Roberts, it is one grim event after another stranded under this devil woman’s thumb. Don’t do what she says and she’ll finger him to the cops for Haskell’s murder. In a cheap hotel room, the two battle it out in a grim game of noir poker. Roberts refusing to go along with her crazy plan calls her bluff to call the cops then backs down. It’s a game in which she holds all the cards. Holding the winning hand she gets drunk taking the phone into the bedroom locking the door behind her. Afraid she’s going to call the cops Roberts bangs on the door then begins to pull the phone cord out from under the door, pulling tighter and tighter. He calls out her name. No answer. He breaks the door down and there she lays, the phone cord wrapped around her neck. Afraid he’ll now be picked up for Vera’s murder also, he takes off heading out of L.A., a hard luck loser resigned to his fate. Throughout the film’s short 67 minute running time, Al Roberts puts the blame for his disastrous life choices on destiny. He views himself as a helpless victim of luckless misfortune. But it seems most of what happens to Roberts is due to his own bad judgment. He made his own ill-conceived fate when he decided to impersonate Haskell, steal his identity, and added to it when he picked up the venomous Vera, remaining under her thumb for the entire story. 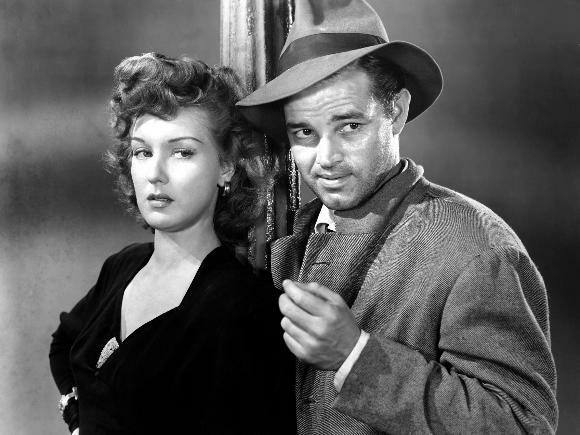 At one point she calls him a dope (Kathleen Turner’s character in “Body Heat” would echo a similar line about William Hurt saying , he is not too bright and adding “I like that in a man.”); however, different from many noir anti-heroes, Roberts is not hooked on the dame; he wants out, unlike say, Fred MacMurray in “Double Indemnity” or Burt Lancaster in “Criss Cross,” two iconic noir saps hooked on scheming dames. In Robert’s case, he is trapped in a prison of his own making; a doomed, pathetic, masochistic loser. Ulmer shot the film in six days on a miniscule budget (depending on the source the film’s budget ranges between $20,000 and $100,000) cheap even by poverty row standards. Made by PRC, the film is based on a novel by Martin Goldsmith who also wrote the screenplay. Goldsmith also wrote another classic “B” noir, “The Narrow Margin” as well as a lesser known crime film called “Shakedown.” The film is filled with matte screen shots, darkly lit scenes, fog, and stock footage all used to obscure the cheap sets and lack of money Ulmer had available to work with (PRC allowed him only 15,000 feet of film). As Martin Scorsese points out in “A Personal Journey with Martin Scorsese Through American Movies,” after Roberts accidently strangles Vera, Ulmer allowed a in and out of focus shot to remain in the finished film because he could not afford to reshoot yet, Scorsese continues, the shot reflects the “character’s disoriented mental state.” Ulmer used these restrictions he was faced with to contribute to the dark grim, moody, existential atmosphere that has made this film have such a strong everlasting effect. His use of light, shadow and camera, with the aid of cinematographer Benjamin Kline, created a moody grim tight claustrophobic ambiance that gives the film a visual style lesser talents with much larger budgets could not obtain. Tom Neal, a former boxer, could have read the script as a sign of things to come in his real life. In the early 1950’s Neal got into a fight with actor Franchot Tone over actress Barbara Payton who Tone was engaged to. Tone and Payton would marry but it was short-lived and she would later move in with Neal. Their relationship would not last either. 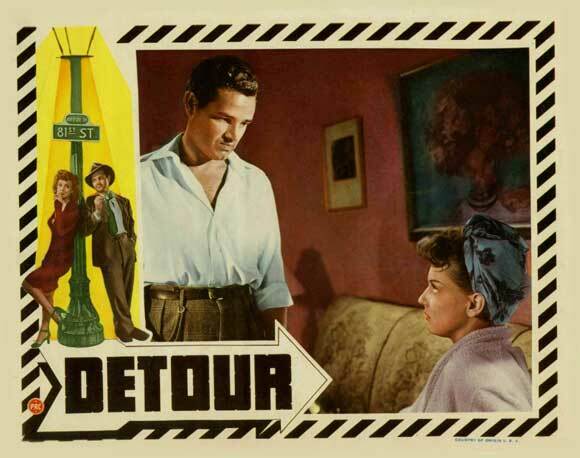 In 1957, Neal would marry and father a son, Tom Neal Jr., who would recreate the role his father played in a 1992 remake of “Detour.” Neal’s wife passed away from cancer shortly after young Tom Jr. was born. A few years later the older Neal remarried a woman named Gale Bennett who he ended up shooting in the head killing her instantly. Neal claimed it was an accident but he was convicted of involuntary manslaughter and sentenced to 15 years in jail. In late 1971 he was released and died the following year of a heart attack. His life was a noir story of all its own. This entry was posted in 1940's, Edgar G. Ulmer, Film Noir, Film Reviews and tagged Ann Savage, Detour, Edgar G. Ulmer, Film Noir, Tom Neal. Though I didn’t rate the film so high in my humble review, got to admit it was a pleasure reading your detailed take on Detour. The film sure had a lot of history behind it, and a lot of anecdotes associated with it. And for all the shabby production design and the largely unimpressive performances of the actors, I agree one does have to appraise the film in its context – the fact that it was a B-noir and shot in limited budget and in only 6 days (or so they say). And yeah, the kind of fatalism that’s pervades nearly every scene of the film – well, that’s truly something! I think this film shows that talent can overcome all kinds of obstacles and still result in a great film. Thanks Marilyn. The blogathon has been going great so far. I will be making a donation today or tomorrow for sure and recommend everyone give what and if you can. This is very well-done review of one of the great “B” noirs. The scene with the phone cord is a stunner (I put it in the same class as the telephone murder scene in Sam Fuller’s THE NAKED KISS). I didn’t know Tom Neal’s life story–very interesting, but also sad. Yeah, that was surprising. One other thing I really like and did not mention in the review is the dialogue which is hard as nails especially what comes out of Vera’s mouth. Excellent review, John, of one of my favorite noirs and one of the best films from the great Ulmer. Its roughness is precisely its appeal: those out-of-focus shots and the occasional awkward angle only contribute to the sense of desolation and ruin in the film. It’s a story about utter dejection, and its bottom-of-the-barrel aesthetics are perfectly suited to those ugly, sad emotions. And as Marilyn hints, there’s a very good chance that this character is an unreliable narrator, which further complicates the film’s story. I’ve always thought it likely that things didn’t really happen the way he says they did, that he’s concocting these totally implausible scenarios to justify the murders he’s committed. That’s interesting Ed that maybe we are only seeing/hearing his slanted side of the story. How many ‘accidental’ murders can one person be involved in. I agree, the bare bones rawness of the film complements the characters, the atmosphere, the story which only makes the film more appealing. Certainly one of the iconic films of noir. Thanks!!! Ulmer possessed uncanny talent and the proper sensibility to negotiate the subversive implications of the film, and a world view to get around the ludicrous underpinnings of the story. Ann Savage is an acting star here playing as tawdry and despicable character in all of noir, and the film, with minimal indoor sets, is probably the most claustrophobic of any enrty in this form, indeed in any fatalistic drama. It is easy to find fault in this film as it’s dialogue may be seen as stereotypical, but it’s intensity and stylishness put in a special category. While some may see it as a heavy-handed self-parody, it was played straight, which paradoxically gives it an uncompromising and corrosice heft. There is a bitter irony in Tom Neal’s character of course, as the real-life actor killed his wife and served prison time. On screen he plays the ultimate loser. As always John, your discussion of the film’s inception and reception greatly embellishes it historically and makes that vital connection between actor and character. Right Sam, if you follow the rules of what is a good film one would find plenty of fault in DETOUR, out of focus shots, mediocre acting and a ludicrous script. But Ulmer manages to transcend his poverty row limitations through sheer talented use of camera and lighting painting a tortured vision of life at the bottom. Great review, John. I watched this last night – must agree with you and Ed that this narrator seems to be unreliable, signalled by the way that he continually says he knows people won’t believe him. There seem to be three supposedly accidental crimes in the film – the one that led to Charlie Haskell fleeing home in the first place, and the two that Al commits. I was interested to note that both Charlie and Vera are ill – not sure what the reason for this is, but it helps the impression of hopelessness and darkness which runs all through the film. I was also impressed that the very last shot of the film shows Al being picked up by a car – leading back to the two pick-ups of hitchhikers earlier. Vera seems to have some mysterious illness which may be reason for her bitter attitude toward life though I think I am giving her the benefit of the doubt(lol). She is probably just a nasty bitter individual. Enjoyed you write up, a great look at the film. While not one of my favorite noirs, it is a lot of twisted fun with some truly great moments and a healthy sense of doom. The phone cord was wonderful! I like the “healthy sense of doom” phrase. Quite appropriate! Thanks Brett.